Peritraumatic Dissociation and PTSD: a Shortcut to Neurodegeneration? Background: Peritraumatic dissociation has become increasingly important for both the diagnosis and the prognosis of Post-traumatic Stress Disorder (PTSD) and Acute Stress Disorder (ASD). Changes in inflammatory mediators, immune-related genes and alterations of the hypothalamic-pituitary adrenal axis are suggestive findings that support the role of stress and neurodegeneration that might result in negative cognitive outcomes, such as dementia and other comorbidities. This study aims to describe an ASD case with persistent peritraumatic dissociation, its evolution to PTSD and the concomitant early onset demential syndrome. Methods and Findings: The patient, a woman, victim of urban violence, experienced peritraumatic dissociation; she was diagnosed with ASD and later developed PTSD and concomitant EOD, the latter being an unexpected and devastating outcome. Dissociative symptoms and cognitive impairment persisted throughout the patient’s clinical status evolution. Moreover, the patient underwent a full psychiatric interview and was assessed through a battery of neuropsychological tests, neuroimage studies and a complementary examination. Over two years, no proposed treatment was satisfactory for improving her symptoms of PSTD and the neuropsychological evaluation confirmed EOD. Conclusion: This case illustrates that peritraumatic and persistent dissociation can be a possible psychopathological marker of neurodegeneration and an important factor for causing irreversible functional impairment. Dissociative symptoms, predominantly peritraumatic dissociation, have become increasingly important for both the diagnosis and prognosis of Post-traumatic Stress Disorder (PTSD) and Acute Stress Disorder (ASD). Prospective studies [1,2] and meta-analyses [3,4] also indicate that dissociative reactions in the peritraumatic period would not only have a maladaptive character, but would also be a risk factor for developing later psychopathological manifestations. The importance of dissociation in PTSD has been emphasized by many robust researches in the field [5,6] and there have been recurrent discussions if PTSD is best seen as an anxiety disorder or as a dissociative disorder [7,8]. Currently the Diagnostic and Statistical Manual of Mental Disorders DSM-5 has classified PTSD in the new chapter of trauma- and stressor-related disorders and has included its dissociative subtype as a new feature . Patients in this group would present predominant dissociative manifestations of depersonalization and derealization and would develop poor prognosis characterized by more severe functional impairment and psychiatric comorbidities, greater suicidality and history of early and multiple trauma . Despite the growing interest in trauma and dissociation, this theme remains widely unclear. This phenomenon can be understood in several confusing and contradictory ways and there is not a universally accepted concept of dissociation. A review of 53 studies on PTSD and peritraumatic dissociation showed that none of them offered at least one definition of dissociation . Dissociation can be considered as a process, an organization, a set of symptoms, or even as psychological defence mechanisms depending on the researcher theoretical position. Another element to factor in is if all dissociative symptoms represent the same neurobiological phenomenon. This question also remains unanswered . Nevertheless, the link between peritraumatic dissociation/dissociative symptoms and a more severe dysfunctional evolution in post-traumatic conditions, draws attention to an understanding of the physio pathological pathways possibly involved in this process. The physiological consequences of acute and chronic stress and trauma related conditions on several organs and systems have been well documented since the first studies of Hans Selye, almost 80 years ago . More recently a focus on the possible longterm “neurotoxic” effects of stressful life events has been proposed  and suggestive findings support the role of life stress, and PTSD in particular, in promoting negative cognitive outcomes, including worse than normal changes with aging, Alzheimer’s Disease, and Vascular Dementia. The physiopathology of PTSD can be characterised from many different perspectives, including genetic, molecular, and neurochemical factors as well as neuro-circuitry and cognitive factors. A possible mechanism that may link PTSD to higher rates of dementia can be explained by the hypothalamic pituitary-adrenal axis alterations that often accompany PTSD until late in life. According to this model, dysregulation of the stress axis would augment inflammation and have a direct effect on brain regions that are critical for processing fear and anxiety, such as the prefrontal cortex, insula, amygdala and hippocampus in chronic PTSD . A range of evidence, in cross-sectional genetic and epigenetic studies, suggests that higher inflammation is associated with increased PTSD severity [16-18]. Other, reasons to believe that PTSD might be associated with accelerated brain aging is the cooccurrence of depression, head injury, or medical comorbidities, all conditions associated with both PTSD and dementia. However, causal links between stress and PTSD and dementia, although suggested, have not been established . Early Onset Dementia (EOD) or Presenile Dementia affects people under 65years of age and although it is considered a public health problem, it is still poorly documented and understood. It is underdiagnosed and inadequately treated, with limited services and resources in many countries . Neurodegenerative diseases were the main causes of dementia in younger patients and they are more likely to have rare forms of dementia. EOD has a fast progression compared with Senile Dementia, with more extensive brain damage and complications . There is a considerable delay of 2 to 3 years after the onset of symptoms to diagnose EOD, which can be explained by many factors: patients and family members do not normally consider the possibility of dementia at a young age, which delays seeking medical advice; clinicians, who are less likely to consider a diagnosis of dementia in young patients; the often prominent psychiatric manifestations and affected non memory cognitive domains . This clinical case describes a patient with ASD, persistent peritraumatic dissociation, its evolution to PTSD and the concomitant early onset demential syndrome, provoking unexpected and devastating outcomes. This case illustrates the role of peritraumatic dissociation as an important predictor of PTSD and neurodegeneration and its fundamental implications for pathogenesis of trauma related conditions. The first psychiatric assessment occurred fifteen days after the traumatic event. This and all subsequent evaluations took place in a public mental health service from the Federal University of São Paulo (UNIFESP) specialized in the treatment of victims of violence- “Program for Research and Assistance of Violence (PROVE). The patient was informed about the research and signed the terms of consent approved by UNIFESP’s Research Ethics Committee and was submitted to a first interview utilizing a qualitative approach. PROVE provides support to patient’s victims of urban violence who had experienced acute traumatic events according to Criterion A of DSM-IV . The psychiatric clinical evaluation was supplemented by the Clinician-Administered PTSD Scale (CAPS) , the Peritraumatic Dissociative Experiences Questionnaire, and Self-Report Version (PDEQ-SRV)  were deployed as complementary instruments. PDEQ-SRV is a self-administered questionnaire to track dissociative experiences that occurred at the time of exposure. A score above 15 indicates significant dissociation. A Neuropsychological test battery was also applied by a team of PROVE neuropsychologists 8 and 14 months after the traumatic event to assess the extent of impairment of cognitive functions. The tests were carried out because the patient had complained persistently of cognitive impairment. Inteligence: Wechsler Adult Intelligence Scale (WAIS-III) to measure intelligence . Attention: Selective Attention Test , D2 Test of attention to measure selective and sustained attention and visual scanning speed , Color Trial: test to measure remote divided attention, sustained attention and the ability to achieve fine motor coordination suitable to the task , Divided and Alternating Attention Test . Memory tasks: Wechsler Memory Scale Revised (WMS) to measure different memory functions ; Rey Auditory Verbal Learning Test , Rey Complex Figure Test. Test (RCF), an assessment in which examinees are asked to reproduce an intricate drawing, first by copying it (recognition), and then by drawing it from memory (recall) . Executive functions: Verbal Fluency in which participants have to say as many words as possible from a category - semantic and phonemic- in a given time  and the Wisconsin Card Sorting Test (WCST) a neuropsychological test which measures the ability to display flexibility in the face of changing schedules of reinforcement. Initially, a number of stimulus cards are presented to the participant; the participant is told to match the cards, but not how to perform this task; however, he or she is told whether a particular match is right or wrong . It can assess strategic planning, organized searching, and the ability to utilize environmental feedback, direct behaviour toward achieving a goal, and modulate impulsive responding. Neuroimaging studies, such as magnetic resonance imaging (MRI) and photon emission computerized tomography scans (SPECT) and complete blood count, lipids and hormonal test were also performed. Female, 50 years old, married, catholic, undergraduate sought the Care and Research Program of Violence (PROVE) of Federal University of São Paulo (UNIFESP) to receive psychiatrical assistance. She had no previous psychiatric history or any clinical comorbidities. She is a clinical social worker of a public health service. One of the patients assisted by that service lost his social benefit and consumed with rage, threatened her life, used his hand to mimic a gun and punched her on the mouth. At that precise moment, she sobbed and was completely out of control, subsequently feeling lethargic and sluggish. Some witnesses to the event said that she had hit the aggressor back, but she could not remember doing so. According to her, she felt as if she had not gone through that event. Fifteen days after the traumatic event, she was still felling strange and fearful. She would tremble often and reported having constant chest pain. Before this first psychiatric evaluation, she had consulted with a cardiologist, as she believed she was having a heart attack. Since no cardiovascular alteration was found, the cardiologist referred her to psychotherapy. She would feel unable to carry out her usual daily activities or go out on her own. She lacked the will to perform any simple task. Nothing would give her satisfaction. She described having an absence of feelings. She had intrusive thoughts about what happened and flashes of images where the aggressor´s face came back and forth, sometimes in the form of a hallucination. She was unable to even focus on easy tasks and often blundered while doing her daily activities. She mentioned that once, while cooking rice, she replaced oil with vinegar. On another occasion, she entered the wrong value while paying a bill. She was tired of having to watch over herself and felt devastated, especially worried about her thinking, memory, and attention conditions. During the mental status examination, she was disoriented in time, presenting attention and memory impairment, which included amnesia of some part of the traumatic event. Her speech and mental processes were slow, marked by flashbacks and intrusive thoughts re-experiencing the traumatic event. The patient featured intrusive symptoms, negative mood, dissociation, avoidance, and hyper arousal. Such symptoms are compatible with Acute Stress Disorder according to DSM-5 and she scored 36 on PDEQ. Sertraline 25-50mg/ day was the recommended pharmacotherapy. One month past the event: She reported crying every day and stated that she had no energy during the day. She did not tolerate Sertraline; she had vomit and headaches and was afraid to take any medicine. She felt as if everything was happening in slow motion and she reported the same symptoms described in the first consultation, including the memory lapses. At that time, she fulfilled the PTSD diagnostic and scored 97 at CAPS. Sertraline was switched to Bupropione75mg/day as the initial dose. Two months later: She reported feeling better with Bupropion. She had stopped crying excessively and was able to do more than before, but unlike before, she needed to apply great effort to accomplish these tasks. She complained about many flaws in attention and memory and felt it was impossible to go back to work. She had inadvertently crashed her son´s car parked inside the garage. Agomelatine 25mg/ day was added, but the insomnia got worse and she became overactive, anxious, and irritable, doing many things automatically. Upon completing a task, she would have no feeling of fulfilment. She bought a new car, but that kind of happiness she usually felt was absent. For the risk of hypomania, we suspended Agomelatine and she was given Bupropion 150mg and Citalopram 20mg/day. She was submitted to a Neuropsychological evaluation 8 months later. One year later: She reported fewer intrusive thoughts, better thinking organization and less anxiety. Therefore, she could complete some regular tasks, and felt more functional. But she could not tolerate headaches caused by Citalopram and suspended medication herself. Desvenlafaxine 50mg was prescribed for a short period and rapidly interrupted. In that period, she was diagnosed with abnormal uterine bleeding (post menopause), which was attributed to antidepressant therapy by her gynaecologist. Shortly after, to her dismay, she was diagnosed with Thyroid papilliferous carcinoma. She was very upset, and strived to avoid thinking about the thyroid cancer, as well as the traumatic event. She was submitted to total thyroidectomy and radioiodine therapy; she made a full recovery and had no further complications. Although she was treated with Duloxetine 120mg/day and Levothyroxin 100mcg/day, her cognitive deficit persisted. MRI showed no abnormalities. Two years later: The patient was extremely worried about her cognitive limitations. When she cooked, food would burn in the oven. She was very insecure and distracted to do any new task. On one occasion, while driving into her garage, she failed to break and drove into the gate, damaging both her car and the gate badly. Metilfenidate 10-30mg/day was prescribed, but she tolerated only 20mg/ day. Even though she reported having more energy and better disposition for her activities, she had attention and memory problems and her ability to carry out daily tasks was still very poor and limited. MRI showed no abnormalities, but SPECT scan demonstrated perfusion alteration of frontal lobes. At that time, she scored 106 at CAPS and the neuropsychological test battery was repeated. Patient’s evolution is summarized on Figure 1. 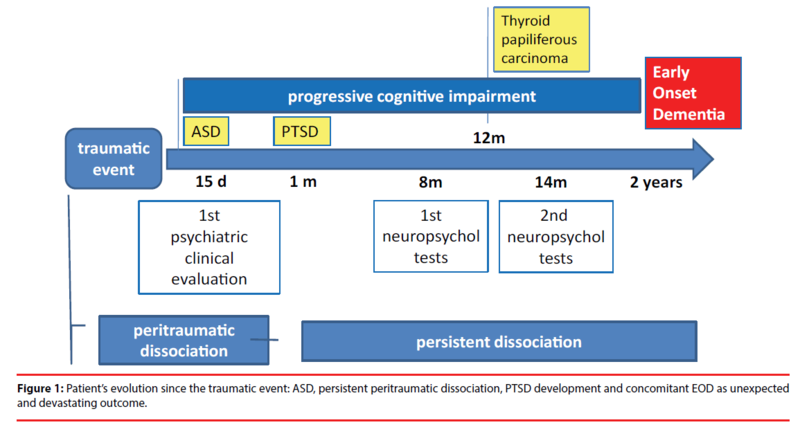 Figure 1: Patient’s evolution since the traumatic event: ASD, persistent peritraumatic dissociation, PTSD development and concomitant EOD as unexpected and devastating outcome. The patient´s performance in each of the evaluated tasks was compared to norms for age and/or education. Her total estimated IQ scored at the high average range = 110, verbal IQ in the average range = 106 and the performance IQ in the high average range= 113. At her first evaluation, 8 months after the traumatic event, she had severe impairment in the ability to focus and select stimuli, as well as difficulties to sustain attention and focus. The ability to alternate between tasks, i.e., sometimes keep the focus on a stimulus and then shift successfully to another one was in the 20% range, representing significant impairment. The ability to divide attention was in the lower range; her tasks had many perseveration and omission errors. She had a borderline performance in more complex activities, involving mental manipulation of information (working memory). Her critical judgment was below average and she had substantial deficit in organization and planning capacity. Analysis, synthesis, abstraction, verbal and logical reasoning were preserved, as well as executive and visual perception skills. Regarding language aspects, she presented higher than average performance in verbal understanding, displaying an extensive repertoire of words and excellent verbal fluency. Memory tasks revealed that short-term memory and long-term auditory-verbal were moderately impaired. She performed better in visual memory tests, but still presenting significant deficits. Semantic memory was preserved. In the second evaluation (6 months after the previous battery) tests were carefully applied to avoid the learning effect; word lists and memory tests were replaced by similar stimuli. Attention still presented severe deficit in sustained, divided, alternating attention and focus. Selective attention declined dramatically, reaching an index below the average for the Brazilian population. Divided attention, remained in the lower range. The ability to alternate tasks remained in the 20% range. The D2 concentration test resulted in many omission errors. Activities that examined working memory continued to show borderline performance, and organizational and planning deficits persisted. Compared with the previous assessment, the patient had decline in motor processing speed. Visual perceptual skills, language, abstraction, analysis, synthesis, logical and verbal reasoning were preserved. Short-term memory and longterm auditory-verbal remained moderately compromised. Visual memory tests scores declined and semantic memory remained preserved. The criteria for ASD and PTSD diagnosis were met after 15 days and one month after the traumatic event, respectively. One can notice that the dissociative symptoms were present since the exact moment of the traumatic event and PEDQ scored 36. Among many dissociative symptoms, the patient emphasized that she was told that she had hit the aggressor back, but was completely unable to recollect this episode. On a day-to-day basis, she felt as if events in her life were not happening to herself and things seemed to be developing in slow motion. She was disoriented in time, lethargic and reported absence of feelings. Peritraumatic dissociative symptoms were listed as: amnesia, depersonalization, derealisation, time-space experience alterations and affective dissociation. Dissociative psychopathology persisted throughout the patient’s clinical status evolution, but affective dissociation was her main complaint in almost every evaluation. The patient described it as indifference, lack of pleasure, absence of feelings, a strange felling, and an empty feeling. Those affective states had in common the fact that they were incoherent with the context meaning and disintegrated from her experience as a whole. Even though DSM-5 recognizes dissociative symptoms in any form of PTSD, they are listed only as amnesia, depersonalization and derealization . Cognitive, sensorimotor alterations and emotional or affective dissociative symptoms are poorly described or not described at all. Some signs of dissociation are merely described as a confusional mental state  or a transitory symptom which impacts diagnosis and treatment. This case is an example of how cognitive-emotional dissociative symptoms can emerge during and following adverse events and remain severe thereafter . Since the 19th century and as early in the 21st century, dissociation has been recognized as the central mechanism leading to a whole spectrum of psychopathological conditions- such as PTSD, conversion and somatization, and affect regulation [38-41]. Psychosomatic diseases, autoimmune disorders and somatization have also been associated with trauma and dissociation . However, there are many problems on conceptualization, classification and recognition of dissociative symptoms which may impact the diagnosis, treatment and prognosis of post-traumatic disorders . In this clinical case, the concept of peritraumatic dissociation was considered a failure of synthesis of the emerging stimuli from internal and external world, including the time–space flow structure that encompasses the perceptual experience, even when the cognitive–perceptual tools are intact. This synthesis qualifies the totality of the perceptual experience as coherent and meaningful to the consciousness/self, enabling possibilities for being/existing . After two years, although our patient reported some general subjective improvement, CAPS increased 9 points compared to her initial score. No antidepressant treatment was satisfactory for ameliorating the PTSD symptoms and the patient manifested intolerance to several drugs. Her best response was obtained with Bupropion, but still insufficient to the patient´s appropriate functioning. Metilfenidate also promoted a partial improvement of the patient’s cognitive symptoms, but the patient dysfunction was still very significant. Although all the available research data on biological findings in PTSD, there are no specific drug targets to treat this condition. From the first evaluation up to two years following the traumatic event, the patient complained persistently about attention and memory impairment. Neuropsychological tests revealed cognitive decline in all attention aspects and visuomotor processing speed as well as compromised executive and memory functions. This case apparently has an abrupt onset and an identifiable emotional precipitant, which suggests a psychiatric rather than neurodegenerative diagnosis, but one can notice progressive impairment of cognitive functions over time, leading to an unexpected and devastating outcome: as an early onset demential syndrome. Psychological stress and stress-related disorders have been recognized as an increasingly widespread public health problem and women are twice as likely as men to suffer from stressrelated psychiatric disorders such as posttraumatic stress disorder and clinical burnout syndrome [45,46]. It has been hypothesized that chronic stress conditions can lead to neural degeneration and Alzheimer Disease (AD)  and there are several neurohormonal pathways and genetic mechanisms to support this association. Prolonged exposure to an excess amount of glucocorticosteroids at the time of a disadaptative stress episode would have deleterious effects on the hippocampus . Indeed, the hippocampus plays a central role in a number of functions affected by dementia, such as memory, learning process and emotional adjustment. Severe dissociation has been correlated with slowness in processing information and distractibility. Depersonalization disorder (DPD), a dissociative disorder characterized by a subjective sense of unreality and detachment, has been linked to deficits in perception, short-term memory, cognitive disruption and attentional processes . It is important to emphasize that PTSD should be conceptualised as a systemic disorder encompassing a range of biological dysregulations, including metabolic and altered immune function, reflected in the increased rates of cardiovascular and autoimmune disease. The risk of somatic comorbidities in PTSD appears to be confirmed as a consequence of changes in inflammatory mediators, immune-related genes and alterations of the hypothalamic-pituitary adrenal axis . Thyroid papilliferous carcinoma was diagnosed one year after the trauma event. It is noteworthy that this patient had neither previous symptoms nor hormonal abnormalities or thyropathy family history. The patient was in psychotherapy throughout the follow-up period. Complete blood count, lipids and hormonal tests showed no abnormalities during this period. Alterations in the allostatic load involved in this process should be considered in the development of comorbidities in PTSD, which should be understood as a multisystem illness affecting the entire organism with somatic and neurological consequences. There are numerous factors involved in the pathogenesis of dementia, but it is not clear if chronic stress or PTSD is both necessary and sufficient to result in dementia. Diseases and conditions identified as causes of EOD are mainly neurodegenerative ones, such as Alzheimer Disease, Vascular Dementia, Frontotemporal Lobar Degeneration, Dementia with Lewy Bodies, Traumatic Brain Injury, Alcohol-associated Dementia, Huntington’s disease, Parkinson’s disease Dementia, Mixed Dementia and Creutzfeldt- Jakob disease and Down’s syndrome . Neurodegenerative diseases that target brain circuits involved in social and emotional processes create symptoms that mimic very closely those seen in psychiatric disorders and even highly experienced clinicians may be confounded. Many neurodegenerative diseases indicate convergence with psychiatric syndromes and can be a powerful model system for studying the neural correlates of psychopathological symptoms. Notwithstanding, studies on neurodegenerative diseases have emphasized “cognitive” processes primarily (e.g., memory, visuospatial abilities, language, executive control, computation), and thus do not capture the emotional and social processes that are so relevant in psychopathology . This case illustrates the importance of recognizing peritraumatic dissociation, a condition still poorly described and understood, as an important predictor of PTSD and as one possible harbinger of neurodegeneration causing irreversible functional impairment, such as an early onset demential syndrome. Though suggested causal links between stress and PTSD and dementia have not been established, neurodegenerative conditions are the main causes of dementia in the pre-senile population. Thus, a full recognition of dissociation as psychopathological marker could be helpful to improve ASD and PTSD diagnoses and orient more effective treatment to comorbidities and consequences. Proper investigation of neuropsychological functioning may have important implications for the effective clinical management of patients with ASD and PTSD and must be considered even in dissociative states. The neurobiological changes involving trauma and dissociation are only part of a plethora of pathologies pathologies that affect the whole organism and compromise brain, body and mind. We thank to Universidade Federal de São Paulo (UNIFESP) and Coordenação de Aperfeiçoamento de Pessoal de Nível Superior (CAPES) to academic support and assistance and declare no conflict of interests. Panasetis P, Bryant R. Peritraumatic versus persistent dissociation in acute stress disorder. J. Trauma Stress 16(6), 563-566 (2003). Arieh YS, Tuvia P, Laura CSS. Predictors of PTSD in injured trauma survivors: a prospective study. Am. J. Psychiatry 153(2), 219-225 (1996). Lensvelt MG, Hart O, Ochten JM, et al. Relations among peritraumatic dissociation and posttraumatic stress: a meta-analysis. Clin. Psychol. Rev 28(7), 1138-1151 (2008). Ozer EJ, Best SR, Lipsey TL, et al. Predictors of posttraumatic stress disorder and symptoms in adults: A meta-analysis. Psychol. Bull 129(1), 52-73 (2003). Bremner JD. Acute and chronic responses to psychological trauma: where do we go from here? Am. J. Psychiatry 156(3), 349-351 (1999). Marshall RD, Spitzer R, Liebowitz M. Review and critique of the new DSM-IV diagnosis of acute stress disorder. Am. J. Psychiatry 156(11), 1677-1685 (1999). Brett EA. The classification of posttraumatic stress disorder. In: van derKol k BA, McFarlane AC, Weisaeth L, Traumatic stress: The effects of overwhelming experience on mind, body, and society. New York: Guilford Press 117-128 (1996). van der Hart O, Nijenhuis ERS, Steele K. The haunted self: Structural dissociation and the treatment of chronic traumatisation. New York: Norton (2006). Association AP. Diagnostic and statistical manual of mental disorders. Arlington, 5th ednt. VA: American Psychiatric Publishing (2013). Lanius RA, Vermetten E, Loewenstein RJ, et al. Emotion modulation in PTSD: Clinical and neurobiological evidence for a dissociative subtype. Am. J. Psychiatry 167(6), 640-647 (2010). van der Hart O, Nijenhuis ERS. Dissociative disorders. Oxford Textbook of Psychopathology, 2nd ednt. New York: Oxford University Press 452-481(2008). Emily AH, Richard JB, Warren M, et al. Are there two qualitatively distinct forms of dissociation? A review and some clinical implications. Clin. Psychol. Rev 2005(1), 1-23 (2005). Szabo S, Tache Y, Somogyi A. The legacy of Hans Selye and the origins of stress research: a retrospective 75 years after his landmark brief “letter” to the editor of nature. Stress 15(5), 472-478 (2012). McEwen B. Physiology and neurobiology of stress and adaptation: central role of the brain. Physiol. Rev 87(3), 873-904 (2007). Michopoulos V, Vester A, Neigh GN. Posttraumatic stress disorder: a metabolic disorder in disguise? Exp. Neurol 284(Pt B), 220-229 (2016). Michopoulos V, Powers A, Gillespie CF, et al. Inflammation in fear and anxietybased disorders: PTSD, GAD, and beyond. Neuropsychopharmacology 42(1), 254-270 (2017). Gola H, Engler H, Sommershof A, et al. Posttraumatic stress disorder is associated with an enhanced spontaneous production of pro-inflammatory cytokines by peripheral blood mononuclear cells. BMC Psychiatry 29, 13:40 (2013). Heinzelmann M, Gill J. Epigenetic mechanisms shape the biological response to trauma and risk for PTSD: A Critical Review. Nurs. Res. Pract 2013, 10 (2013). Greenberg MS, Tanev K, Marin M-F, et al. Stress, PTSD, and dementia. Alzheimer’s Dement 10(3), S155-165 (2014). Vieira RT, Caixeta L, Machado S, et al. Epidemiology of early-onset dementia: a review of the literature. Clin. Pract. Epidemiol. Ment. Health 9, 88-95 (2013). Tindall L, Manthorpe J. Early onset dementia: A case of ill- timing? J. Ment. Health 6(3), 237-249 (1997). Harris PB, Keady J. Living with early onset dementia: exploring the experience and developing evidence-based guidelines for practice. Alzheimers. Care. Today 5(2), 111- 122 (2004). Association AP. Diagnostic and statistical manual of mental disorders. American Psychiatric Press, Washington, DC (2000). Wheathers F, Keane T, Davidson J. Clinicianadministered ptsd scale: a review of the first ten years of research. Depress. Anxiety 13, 132-156 (2001). Fiszman A, Marques C, Berger W, et al. Transcultural adaptation to the Portuguese of the Peritraumatic Dissociative Experiences Questionnaire, Self-Reporting Version / Cross-cultural adaptation of the Peritraumatic Dissociative Experiences Questionnaire, Self-Report Version, to Brazilian Portuguese. Rev. Psiquiatr. Rio Gd. South 27(2), 151-158 (2005). Weschler D. WAIS-III administration and scoring manual. San Antonio: The Psychological Corporation (1997). Camilo F. Teste de atenção seletiva (TAS). São Paulo: Editora Vetor (2008). Brickenkamp R. Teste D2: Atenção concentrada, Manual/Padronização Brasileira. São Paulo: Casa do Psicólogo (2002). Rabelo I, Pacanaro S, Rossetti ML. Teste Trilhas Coloridas. São Paulo: Casa do Psicólogo (2010). Javier F, Rueda M. TEADI / TEALT - Teste de Atenção Dividida e Teste de Atenção Alternada. 2nd ednt. São Paulo: Casa do Psicólogo (2010). Magalhães SS, Hamdan AC. The Rey Auditory Verbal Learning Test: normative data for the Brazilian population and analysis of the influence of demographic variables. Psychol. Neurosci 3(1), 85-91 (2010). Oliveira MS. Figuras Complexas de Rey. São Paulo: Casa do Psicólogo (1999). Dozzibrucki SM, Fleury Malheiros SM, Okamoto IH, et al. Dados normativos para o teste de fluência verbal categoria animais em nosso meio. Arq. Neuropsiquiatr (1997). Heaton RK. Wisconsin card sorting test manual odessa. Florida: Psychological Assessment Resources (1981). American Psychiatric Association. Diagnostic and statistical manual of mental disorders: DSM-5. Washington, DC (2013). Chefetz RA. Ten things to consider on the road to recognizing dissociative processes in your psychotherapy practice. Psychiatry 78(3), 288-291 (2015). Carlson EB, Dalenberg C, McDade-Montez E. Dissociation in posttraumatic stress disorder part I: Definitions and review of research. Psychol. Trauma Theory, Res. Pract. Policy 4(5), 479-489 (2012). Nemiah J. Conversion: fact or chimera. Int. J. Psychiatry Med 5(4), 443-448 (1974). van der Kolk B, Pelcovit D, Roth S, et al. Dissociation, somatization, and affect dysregulation: the complexity of adaptation to trauma. Am. J. Psychiatry 153(7), 83-93 (1996). Bremner JD. Does stress damage the brain? Understanding trauma-related disorders from a mind-body perspective. New York: WW Northon (2002). Nijenhuis ERS. Ten reasons for conceiving and classifying Posttraumatic Stress Disorder as a dissociative disorder. Psichiatr. e Psicoter 33(1), 74-106 (2014). Taylor GJ. Affects, trauma, and mechanisms of symptom formation: a tribute to John C Nemiah, MD (1918-2009). Psychother. Psychosom 79(6), 339-349 (2010). Nijenhuis ERS, van der Hart O. Dissociation in trauma: a new definition and comparison with previous formulations. J. Trauma Dissociation 12(4), 416-445 (2011). Mattos P, Pedrini J, de Meilo M. The concept of peritraumatic dissociation: A qualitative approach. Qual. Health Res 26(7), 1005-1014 (2015). Johansson L. Can stress increase Alzheimer’s disease risk in women? Expert. Rev. Neurother 14(2),123-125 (2014). Ford JD, Stockton P, Kaltman S, et al. Disorders of extreme stress (DESNOS) symptoms are associated with type and severity of interpersonal trauma exposure in a sample of healthy young women. J. Interpers. Violence 21(11), 1399-1416 (2006). Lupien SJ, McEwen BS, Gunnar MR, et al. Effects of stress throughout the lifespan on the brain, behaviour and cognition. Nat. Rev. Neurosci 10(6), 434-445 (2009). Guralnik O, Giesbrecht T, Knutelska M, et al. Cognitive functioning in depersonalization disorder. J. Nerv. Ment. Dis 195(12), 983-988 (2007). McFarlane AC, Lawrence-Wood E, Van Hooff M, et al. The need to take a staging approach to the biological mechanisms of PTSD and its treatment. Curr. Psychiatry Reports 19(1), 10 (2017). Levenson RW, Sturm VE, Haase CM. Emotional and behavioral symptoms in neurodegenerative disease: a model for studying the neural bases of psychopathology. Annu. Rev. Clin. Psychol 10(1), 581-606 (2014).